Coupes may not be as popular with buyers today as they once were, but the Cadillac ATS-V Coupe serves as something of a performance and design flagship for General Motors’ thoroughly revived luxury division. With its headquarters now in trendy New York City and its engineering split between Detroit and Germany, Cadillac is ready for—and in some ways outright leading—the big leagues in terms of performance. And though the ATS-V Coupe isn’t the brand’s most expensive model, it's still the most stylish. Functionally identical to the ATS-V Sedan, the coupe differs mainly in its styling. Not only is its side profile different, but the ATS-V Coupe’s tail lamps are more dramatically styled. The changes make for a more aggressive-looking car overall. Underneath the coupe’s hood sits a ferocious twin-turbocharged 3.6-liter V6 engine rated at 464 hp and 445 lb-ft of torque, which will push it to 60 mph from a stop in just 3.6 seconds before topping out at a staggering 189 mph (where legal, we should add). Both a 6-speed manual and an 8-speed automatic are available, the latter bringing with it paddle shifters. Like a supercar, the ATS-V includes a launch control mode that helps ensure perfect and repeatable acceleration runs at the mash of the gas pedal. Furthering its near-supercar credentials are Brembo-branded performance brakes at all four corners to quickly slow things down. When it comes to ride and handling, the ATS-V Coupe builds on the already sporty ATS with Cadillac’s Magnetic Ride Control suspension, which tightens things up at the press of a button for corner carving. A track aerodynamics package is on the options list, including exterior trim pieces that make the car cheat the wind even better. One thing to note for those in wintry markets, however, is that all ATS-Vs are rear-wheel-drive and come standard with summer tires. Surprisingly, the ATS-V Coupe is relatively fuel-efficient given the power on tap: trims with the manual transmission check in at an EPA-estimated 17 mpg city/23 highway/19 combined, while the automatic version moves those numbers to 16/24/19. 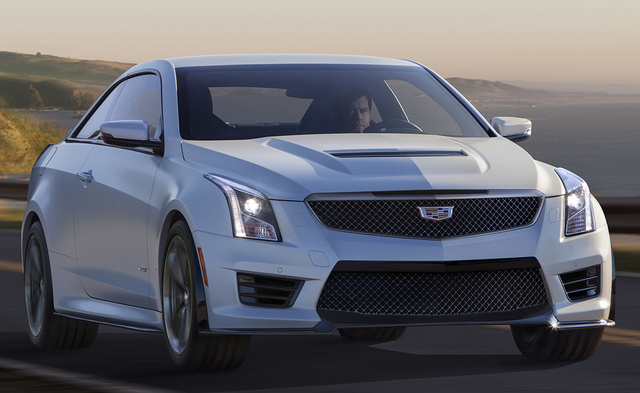 The ATS-V looks the part inside, too, with bolstered front sports seats and available carbon fiber trim. Optional Recaro seats add adjustable side bolsters and sueded microfiber inserts designed to grip passengers better during hard cornering. Cribbed from the Chevrolet Corvette is an optional Performance Data Recorder that works like a far more high-tech airplane black box, allowing drivers to record their track laps via a high-resolution camera. The recorder lets drivers watch their track experience either on the car’s CUE infotainment system or on their computer at a later date. Cadillac’s CUE system has been updated since its launch with improved graphics and a faster processor. Working something like a tablet in that it offers “pinch and scroll” functionality, CUE is among the more advanced infotainment systems on the market. Additionally, it includes Apple CarPlay and Android Auto compatability, as well as a 4G LTE antenna that can turn the car into a mobile Wi-Fi hotspot. General Motors’ OnStar safety and concierge system also comes standard, though it requires a monthly charge after an initial trial period. An optional Driver Awareness Package for the ATS-V includes a forward collision alert system that buzzes the base of the driver’s seat and flashes a bright red light if an impending impact is detected. However, unlike on the standard ATS, the system will not apply the brakes if it detects a wreck. In National Highway Traffic Safety Administration crash tests, the ATS lineup earned 5 out of 5 stars in the side-impact and rollover categories, but it hasn’t been evaluated yet by the Insurance Institute for Highway Safety. What's your take on the 2017 Cadillac ATS-V Coupe? Have you driven a 2017 Cadillac ATS-V Coupe?